Fulfil the maximum number of orders possible by centralising all of your stock information using our Distributed Order Management tools. 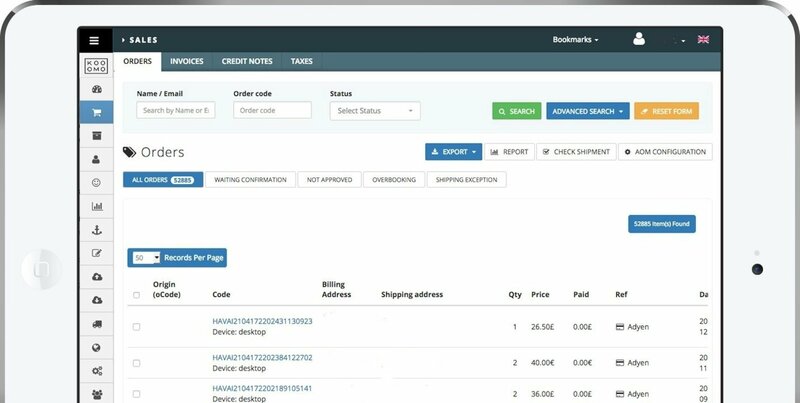 Get detailed reports on the orders coming through from all digital commerce sales channels in your customised order report dashboard. Gain instant insight into your high-performing channels - be it your eShop, online marketplaces, Google Shopping, or even in-store through a POS. Smart tools within the Kooomo digital commerce platform allow you to activate specific rules and filters to effectively manage all orders and move them through various processes. Filters enable users to ensure that all orders are processed accurately. For example, you can set a rule whereby you command the platform to 'Check for all orders with status PAID', set the action to 'Create invoice, generates shipping labels, invoices, and return slips', and apply a filter to exclude 'Any orders missing a phone number/partial address, etc.' There's no need to spend hours manually inputting or updating order information - the platform does all the hard work so you don't have to! Review and manage all incoming requests for returns, exchanges, and refunds through the order management dashboard. You can also access the customer service portal to check queries about specific orders, to ensure a positive customer experience.